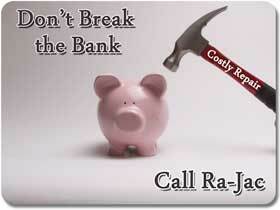 At Ra-Jac Sales and Services we understand that a new air conditioning and heating system is a major investment in your home and because of this we offer comprehensive estimates of the new and replacement air conditioning, heating, ventilation, and air cleaning systems that we install to allow you to get financing from your credit union or bank to make this purchase without straining your budget. We offer solutions - We can offer solutions for difficult problems like air borne allergies, dust and dust mites, hot and cold spots, cutting high AC and heater energy costs, carbon monoxide leaks and detection, lost efficiency, duct leakage, custom duct work design, zoning systems, air filtration, air cleaners and purification systems, dehumidifiers and humidifiers, digital and programmable thermostats, service agreements, annual inspections, and many other problems. We also accept cash, checks, and most major credit cards. 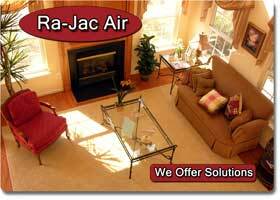 We Service all Brands - Ra Jac Sales and Services offers a complete line of air conditioners, electric and gas heaters and heat pumps to meet your every need. 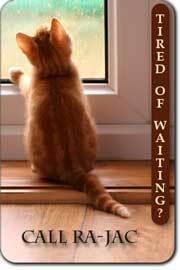 We offer full service on Carrier, Payne, Byrant, Heil, Lennox, Trane, Whirlpool, Tempstar, Arco, Armstrong, Bard, Bohn, Coleman, Amana, American Standard, Day & Night, Fedders, Climatrol, Airtemp, Hunter, Emerson, Friedrich, Intertherm, Janitrol, Goodman, Ruud, Rheem, Westinghouse, York and all other brands. Our Texas Service Areas -- If you are in the Algoa, Arcadia, Bacliff, Bayou Vista, Clear Lake City, Clear Lake Shores, Dickinson, El Lago, Friendswood, Galveston, Hitchcock, Kemah, La Marque, League City, Nasa Area, Nassau Bay, San Leon, Santa Fe, Seabrook, Taylor Lake Village, Texas City, Tiki Island, or the Webster Texas areas and want a professional to maintain your air conditioning, heating or air cleaning and filtration system contact us at (409) 945-4171.